Your search is over if you have been trying to identify a resource for cooling tower cleaning, cooling tower maintenance, or cooling tower repair in Frederick, Maryland. Our company has established a reputation as the go-to resource for commercial HVAC work in this area, and we take our commitment to the community very seriously. When you reach out to us for a cooling tower repair, cooling tower maintenance, or cooling tower cleaning, you can rest assured that you will get a fast response. The job will be done impeccably, and as the icing on the cake, you will find that our rates are very affordable. This vibrant city serves as the County Seat of Frederick County, and it offers residents a very high quality of life. It is well known for the very interesting architecture that dots the landscape, and there are many cultural centers, including the Weinberg Center for the Arts, and it is the home of the Maryland Shakespeare Festival. It is a very special place, and we have made many friends in town over the years. From Urbana to City Center to Clover Hill, for cooling tower repair, cooling tower maintenance, and cooling tower cleaning in Frederick, Maryland, ACT is the only logical choice. We definitely have you covered if you need us to work on your cooling tower, but our offerings do not stop there. Air handler maintenance is another area of specialization for our company. If your air handler is not functioning optimally, a host of problems can ensue, and energy efficiency will suffer. You should definitely engage our air handler maintenance services, because you will save a lot of money over the long haul. You can also rely on us if you need an air handler repair in Frederick, Maryland. Time is money when you are running a business, so we prioritize emergency air handler repair calls. Plus, we know that you need a quick resolution, so our trucks are fully equipped with all parts to complete most air handler repair assignments in just one visit. 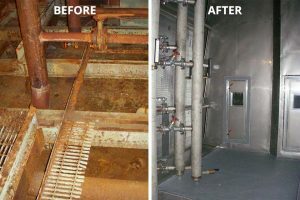 Whenever you need cooling tower cleaning, cooling tower maintenance, a cooling tower repair, air handler repairs, or air handler maintenance in Frederick, MD give us a call at 703-547-1680. There is also a contact form on this site you can use to send us a message.